Although Freeman Vape is a relatively new company, it was started by an industry veteran who has years of experience producing quality, US-made e-liquid. The founder’s first company, Apollo E-Cigs, is a widely-known and well-established name in the vaping industry and has been developing e-liquid since 2013. Apollo still produces dozens of flavors, but Freeman takes a different approach and offers significantly more value. With a streamlined process and limited product selection, Freeman Vape Juice is available at a much more reasonable price point than most of Apollo’s products. And with a dedicated ISO8 clean lab, they certainly didn’t cut corners when it comes to quality. An ISO8 certification means that they follow some the strictest standards when it comes to e-liquid production. There’s no doubt that the team at Freeman has plenty of experience producing e-juice, so lets get into the products – and Freeman’s flavors. 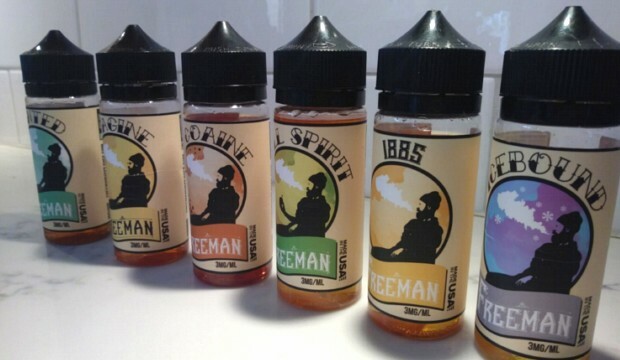 Freeman doesn’t have the widest selection of e-liquid, but they offer options in almost every flavor category to appeal to virtually everyone. Part of the way they keep prices down is by limiting their flavor selections and bottle sizes. They have nine flavors in total, and all of them come in 30ml or 120ml bottles; or you can purchase a full sampler of all nine flavors in 30m bottles for only $27. 1885 (3.5/5) – Vanilla flavors tend to be a little boring to us, but 1885 was definitely well-executed with a smooth, creamy backdrop that lent itself well to the vanilla milkshake profile. Although it tasted slightly artificial, it seemed to combine just the right amount of sweet and creaminess, with almost no throat hit or harshness. Plenty of vanilla flavoring, but not the authentic, spicy vanilla bean kind. An above average vanilla flavor that we were happy to finish off; right after our favorites from Freeman were gone. Cococaine (3/5) – After the first few puffs, our initial impression of Cococaine was overwhelmingly positive. It’s super sweet and flavorful, just like coconut sugar cookie. Nothing throaty or harsh about this one either, but after about 1-2ml, it just became too sweet for most of our team’s liking. It could be just a matter of personal preference, but we felt like there was way too much sweetener in this one. Very accurate, but just too sugary sweet. Fall Spirit (3.5/5) – Not the best caramel apple flavor we’ve ever tried, but definitely not the worst either. It leaned towards sweeter side, with a nice bit of crisp apple flavoring followed by a smooth, caramel aftertaste. The apple was just a little bit off, but nothing major to complain about. Overall it was a pretty enjoyable vape; we’d certainly vape it again. Homecoming (5/5) – Overall, Homecoming was probably our favorite flavor during this review. It was certainly the most unique… have you ever tried a strawberry rice pudding flavor before??? We haven’t! Think of a traditional strawberry cream flavor, then mix in some rice pudding with subtle hints of cinnamon. It’s unlike anything we’ve ever tasted, and everyone on our team agreed that it was especially good. Despite the soft, grainy flavor of rice pudding, there’s was no mistaking its presence. And with light undertones of strawberry, Homecoming surprised us with its complexity. Icebound (3.5/5) – Another average to just above average flavor. We tend to like our fruity menthol flavors stronger in the fruit department. Icebound certainly had some berries mixed in, but the menthol overpowered most of the fruity sweetness. Didn’t notice much strawberry, but we did pick up some raspberry and blueberry. If you prefer more menthol than fruit, Icebound is a good choice. We just added some other juice to tone it down. Imagine (4.5/5) – Imagine was definitely one of the better options that came out of our Freeman e-juice review. We’ve experienced some horrible lemon flavors in the past, but Imagine was surprisingly accurate and well-executed. A tasty lemon tart dessert flavor, the lemon was subtle but noticeable; balanced out nicely with smooth and creamy pastry notes. Freeman got this one just right, with the perfect amount of tart and sweetness. Jungle (4/5) – We’ve experimented with a ton of strawberry banana flavors… they’re some of our favorites! Although Jungle is not the absolute best we’ve ever tried, it still deserves a decent score and we’d certainly buy it again. A little heavier on banana side, we would describe it as more of a candy banana, rather than a natural banana flavoring. The strawberry is subtle, but noticeable, making for smooth and flavorful vape. Minted (4/5) – Described as a “mint chip milkshake,” Minted is true to it’s namesake with a sweet and creamy backdrop, anchored by subtle hints of minty goodness. The soft cooling effect of mint was most noticeable upon inhale, followed by a creamy, subtly sweet milkshake with hints of chocolate chip. Reminiscent of mint chocolate chip ice-cream, all of the flavors seemed to blend together perfectly, providing a smooth and enjoyable experience from beginning to end. Definitely above average. Trailblazer (3/5) – Tobacco flavors aren’t necessarily our forte – or specialty – but Trailblazer was a decent tobacco blend with noticeable notes of butterscotch and soft undertones of peanut butter. It started with a creamy tobacco inhale, followed by a lightly sweet, earthy exhale. Definitely enjoyable, we liked it even better with a little 1885 (vanilla) mixed in. Overall we’d say that Freeman Vape Juice is generally well-crafted, with most of their flavor descriptions being right on-point. We weren’t blown away by every flavor in their line-up, but considering the reasonable price point, we weren’t expecting to be yodeling from the mountain tops either. We should point out that Freeman does seem to use a fair amount of sweetener. Some flavors were worse offenders than others, but we definitely wouldn’t call them overly sweet or un-vape-able (like most of Vape Wild’s flavors). Cococaine was the only one that pushed the sweet barrier for us; otherwise the sweetener seemed to be balanced out nicely with the other ingredients. Even though only a few flavors stood out to us during this Freeman Vape Juice review (including Homecoming, Jungle and Minted), most of the others were fully vape-able and right inline with the majority of e-liquid manufacturers on the market. Considering Freeman’s reasonable pricing and unique flavor profiles, it’s definitely great value and worthy of your consideration. ABOUT OUR REVIEWS: Since flavor preferences vary and depend on a variety of factors, we use multiple members of our team to complete our e-liquid reviews. This Freeman Vape Juice review was conducted by: Jeremy Salter, Vanessa Salias and Christopher Arthur. Their feedback was gathered, combined and summarized on this page, but please keep in mind that this is the general opinion of our team and should be treated as such. Performance varies depending on the device, and flavor preferences vary for each individual. We strongly suggest that you consider the feedback of others and experiment on your own.